New Yorkers are on high alert after a bomb in Manhattan injured 29 people and more suspicious devices were discovered in New Jersey. 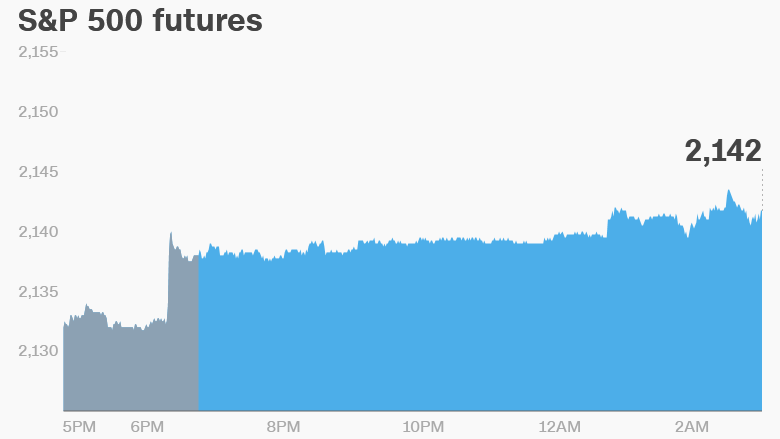 But Wall Street traders seem unfazed by the weekend developments and the ensuing transport disruption. 1. A tricky commute: Crucial transportation links into New York City were closed early Monday after a backpack containing up to five devices was found in Elizabeth, New Jersey. NJ Transit said that Northeast Corridor and North Jersey Coastline rail service had been suspended, and urged customers to find alternate means of transportation. 2. Stock market overview: U.S. stock futures are all moving up, and European markets are mostly positive in early trading. Asian markets ended the day with gains. However, the Australian stock exchange closed lower following a trading day that was riddled with problems. The exchange said on Twitter (TWTR) that it would provide a trading update on Tuesday ahead of the open. 3. Oil on the up: Crude oil futures are rising by about 1.5% to trade around $43.50 per barrel based on hopes that OPEC could soon agree to freeze production levels, along with Russia. OPEC and other producers will hold an informal meeting in Algeria next week to discuss the possibility of capping oil production in a bid to boost prices. OPEC Secretary General Mohammed Barkindo was reported to have said a final decision on limiting production would come later, if consensus could be reached in Algeria. Oversupply caused oil prices to collapse since mid-2014 to a low of around $26 per barrel earlier this year. 4. Market mover -- Samsung: Shares in Samsung (SSNLF) rallied by 2% Monday after the smartphone maker launched a replacement program in its home market of South Korea for its Galaxy Note 7 devices. The company is working to recall and replace 2.5 million Note 7s around the world that are at risk of catching fire due to battery problems. 5. Nigeria's currency crisis: Nigeria's central bank kicks off a two-day meeting on Monday. The central bank is meeting amid an oil fueled recession and a debilitating shortage of foreign currency. The situation has caused problems for airlines, and many major international carriers have stopped flying to the country altogether.